Crunchyroll - Forum - Crunchyroll Comes to PlayStation Internationally! 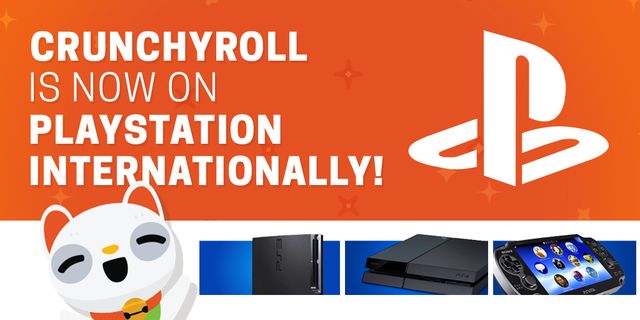 Crunchyroll Comes to PlayStation Internationally! We are excited to announce that the Crunchyroll App is now available on PlayStation Internationally! The app is FREE to download in the PlayStation Store and you can watch several of your favorite anime titles for free as well! For the best experience, with no ads, HD quality, and the latest simulcasts, be sure to get a Premium Membership! The Crunchyroll PlayStation app is currently available throughout the Americas and will now be available in the following territories: UK, Australia, Austria, Bahrain, Belgium, Bulgaria, Croatia, Cyprus, Czech, Denmark, Finland, France, Germany, Greece, Hungary, Iceland, India, Ireland, Israel, Italy, Kuwait, Lebanon, Luxembourg, Malta, Netherlands, New Zealand, Norway, Oman, Poland, Portugal, Qatar, Romania, Russia, Saudi Arabia, Serbia, Slovakia, Slovenia, South Africa, Spain, Sweden, Switzerland, Turkey, Ukraine, UAE. Content availability varies by region. ¡Nos alegra anunciar que la aplicación de Crunchyroll para Playstation ahora está disponible de forma internacional! ¡La aplicación es GRATIS para descargar en la Playstation Store y puedes ver tus series favoritas de forma gratuita también! ¡Para una mejor experiencia, sin publicidad, con calidad HD y los últimos simulcasts, asegúrate de conseguir una membresía Premium! La aplicación de Crunchyroll para Playstation está disponible en América y ahora estará disponible en los siguientes territorios: Reino Unido, Australia, Austria, Baréin, Bélgica, Bulgaria, Croacia, Chipre, República Checa, Dinamarca, Finlandia, Francia, Alemania, Grecia, Hungría, Islandia, India, Irlanda, Israel, Italia, Eslovaquia, Eslovenia, Sudáfrica, España, Suecia, Suiza, Turquía, Ucrania, Emiratos Árabes Unidos. La disponibilidad de contenido varía según la región. Wir freuen uns, ankündigen zu dürfen, dass die Crunchyroll App nun international für Playstation verfügbar ist. Die App liegt kostenlos über den PlayStation Store zum Download bereit und viele deiner Lieblingsanime stehen dir nun kostenlos zur Verfügung. Noch besser ist es als Premiumkunde - ohne Werbung, in HD Qualität und mit den neusten Simulcasts! Die Crunchyroll PlayStation App war bislang nur in den Amerikas verfügbar und wird nun in folgenden Ländern freigeschaltet: Australien, Bahrain, Belgien, Bulgarien, Dänemark, Deutschland, Finnland, Frankreich, Griechenland, Großbritannien, Indien, Irland, Israel, Italien, Island, Katar, Kroatien, Kuwait, Libanon, Luxemburg, Malta, Neuseeland, Niederlande, Norwegen, Oman, Österreich, Polen, Portugal, Rumänien, Russland, Saudi-Arabien, Schweden, Schweiz, Serbien, Slowakei, Slowenien, Spanien, Südafrika, Tschechische Republik, Türkei, Ukraine, Ungarn, Vereinigte Arabische Emirate, Zypern. Die angebotenen Inhalte können sich je nach Land unterscheiden. Nous sommes très heureux de vous annoncer que l’application PlayStation est désormais disponible sur PlayStation à l’international ! Cette application est GRATUITE, il suffit de la télécharger le PlayStation Store. Vous pourrez ainsi regardez gratuitement tous vos animés préférés. Pour plus de confort, supprimez les publicités et profitez de la HD et des derniers épisodes en simulcast en devenant un membre Premium. L’application Crunchyroll sur PlayStation est déjà accessible depuis les Amériques, elle est désormais disponible dans les territoires suivants : Afrique du Sud, Allemagne, Arabie Saoudite, Australie, Autriche, Bahreïn, Belgique, Bulgarie, Croatie, Chypre, Danemark, Émirats Arabes Unis, Espagne, Finlande, France, Grèce, Hongrie, Inde, Irlande, Islande, Israël, Italie, Koweït, Liban, Luxembourg, Malte, Nouvelle-Zélande, Norvège, Oman, Pays-Bas, Pologne, Portugal, Qatar, République Tchèque, Roumanie, Royaume-Uni, Russie, Serbie, Slovaquie, Slovénie, Suède, Suisse, Turquie, Ukraine. La disponibilité de certains programmes peut varier selon les pays. Siamo lieti di annunciare che la App di Crunchyroll è ora disponibile su Playstation in tutto il mondo! Grazie all'app scaricabile GRATUITAMENTE dal PlayStation Store potrai guardare i tuoi anime preferiti senza pagare un solo centesimo! Oppure, con un Account Premium, potrai goderteli al meglio: nessuna pubblicità, video in HD e accesso ai simulcast più recenti! La app di Crunchyroll per PlayStation è già disponibile in tutto il continente americano e d'ora in avanti sarà disponibile anche nei seguenti territori: Regno Unito, Arabia Saudita, Australia, Austria, Bahrain, Belgio, Bulgaria, Cipro, Croazia, Danimarca, Emirati Arabi Uniti, Finlandia, Francia, Germania, Grecia, India, Irlanda, Islanda, Israele, Italia, Kuwait, Libano, Lussemburgo, Malta, Norvegia, Nuova Zelanda, Olanda, Oman, Polonia, Portogallo, Qatar, Repubblica Ceca, Romania, Russia, Serbia, Slovacchia, Slovenia, Spagna, Sud Africa, Svezia, Svizzera, Turchia, Ucraina, Ungheria. I contenuti disponibili variano in base alla regione. يسعدنا أن نعلن لكم أن تطبيق كرانشي رول عبر البلاي ستيشن أصبح متوفراً عالمياً! تحميل التطبيق عبر متجر بلاي ستيشن مجاني وتستطيع أن تشاهد من خلاله العديد من عناوين الانمي المفضلة لديك مجاناً! يُرجى أن ترقي عضويتك في الموقع إلى المميزة لمشاهدة أفضل بدون إعلانات ولمشاهدة أحدث الحلقات بأعلى جودة بعد ساعة من البث في اليابان. التطبيق متوفر على البلاي ستيشن 3 و بلاي ستيشن 4 وبي إس فيتا. تطبيق كرانشي رول على البلاي ستيشن متوفر للدول العربية التالية: البحرين، الكويت، لبنان، عُمان، قطر، المملكة العربية السعودية والإمارات العربية المتحدة. بينما هو متوفر في الكثير من دول العالم. لغة التطبيق هي الإنجليزية ولكنه سيضم الترجمات السبع التي يدعمها الموقع ومن ضمنها العربية. العناوين المتوفرة للمشاهدة في التطبيق تختلف بحسب منطقتك. لمشاهدة الحلقات باللغةِ العربية عبر التطبيق، يجب تغيير اللغة الإفتراضية من خلال اعدادات العضو في الموقع الرئيسي (من هنا) وبعد ذلك أعد تسجيل الدخول إلى حسابك في التطبيق لتستمتع بمشاهدة الحلقات بالترجمة العربية. Estamos empolgados por anunciar que a aplicação da Crunchyroll está agora disponível na PlayStation internacionalmente! A aplicação é GRÁTIS para descarregar na PlayStation Store e também podes ver gratuitamente vários dos teus títulos de anime favoritos! Para desfrutares da melhor experiência, sem anúncios, qualidade HD e das últimas transmissões simultâneas, adquire uma Subscrição Premium! A aplicação da Crunchyroll para PlayStation já estava disponível no continente americano e está agora disponível nos seguintes territórios: África do Sul, Alemanha, Arábia Saudita, Austrália, Áustria, Bahrain, Bélgica, Bulgária, Chipre, Croácia, Dinamarca, Emirados Árabes Unidos, Eslováquia, Eslovénia, Espanha, Finlândia, França, Grécia, Hungria, Índia, Irlanda, Islândia, Israel, Itália, Kuwait, Líbano, Luxemburgo, Malta, Noruega, Nova Zelândia, Omã, Países Baixos, Polónia, Portugal, Qatar, Reino Unido, República Checa, Roménia, Rússia, Sérvia, Suécia, Suíça, Turquia e Ucrânia. A disponibilidade dos conteúdos varia consoante a região. We hope you all enjoy~! So...what was the reason for offering shows in these regions, but not the app? Is there seriously some sort of legal shenanigans you have to go through just to launch an app? Finally it's officially available here. Great job with dealing with those shenanigans! As a UK ps4 user, may I just say... IT'S ABOUT TIME!!!! I'd episode 3 of Free feels like the best written one thus far. Hombree por fin para españa!!!! yheaa ! That's great to hear. Anything that can help proliferate Anime globally gets my vote. Nice news! Now everyone can enjoy on every Playstation console. Hope to get a PS4 later as I'm always watching on my PS3 or PSVITA. Now people don't have to switch region to US only to watch anime on theirs ps4. The question is on which divise will be Crunchyroll legally availably next? ┴┬┴┤( ͡° ͜ʖ├┬┴┬ - Oh, don't mind me, I'll be here...watching. Was super excited that I could finally get Crunchyroll on my PS4!! Then I saw the menu layout, which is rubbish to say the least. But what the hell, so long as I could watch my favourite shows, right? Well, no actually. Tried to watch the new Ep of Food Wars and the video quality was so poor I couldn't tell if the subs were in English or not. Now, I have no problem watching high quality videos on my PS4 via the likes of Netflix, so why does this seem to be such an issue for me with this?